Help your favorite plants thrive and enjoy your gardening hobby year round with the Gardman Four Tier Mini Greenhouse. Starting your seedlings in a greenhouse allows them to form a strong root system, for healthy transplanting when the soil is ready. 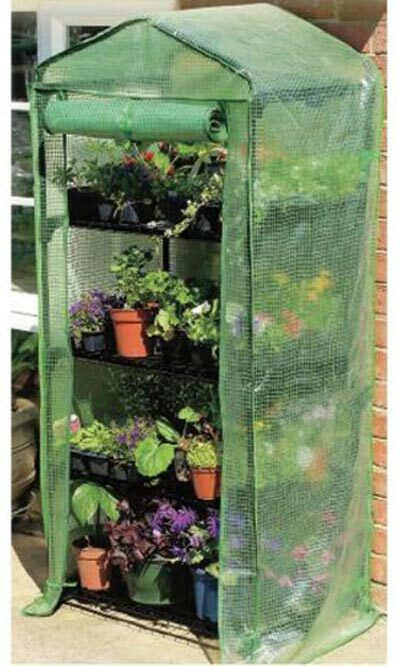 This convenient greenhouse is ideal for beginning gardeners, with its compact design and quick construction. The tubular metal frame pushes together in moments, without requiring any tools, and the four included shelves create a generous amount of space. The 12" tall gap between each lower shelf gives flowers room to grow upward, while the square grid base provides proper drainage. Place the included, reinforced green plastic cover over the frame to help control the temperature inside the unit. Its zippered door rolls upward and secures with a tie, for you to easily maintain your flowers. Place this structure on your deck, patio, or other sheltered area, ensuring it receives significant light throughout the day for optimal plant growth. Wall fixing eyelets allow you to secure this unit to a wall for added stability, or the item may be freestanding on a level surface for repositioning seasonally. Start growing your plants early in this Four Tier Mini Greenhouse. Assembly required.